CULLMAN, Ala. – Ricardo “Rico” Nishimura was playing tennis for a college in Bristol, Tennessee, when he first visited Wallace State more than 13 years ago and decided his story must continue there. “After a tough match against the Lions and falling in love with the Wallace State campus, I was determined to move to Alabama and attend Wallace State,” said Nishimura, who is a native of Sao Paulo, Brazil. He was later recruited by Wallace State and was able to follow through on that determination to attend Wallace State to play tennis. And play, he did. He was not only the top player on the team, he was No. 2 player in the country when he played for the Lions. In Brazil, Rico grew up around tennis – his father is a well-known coach – and he grew up around great food. Nishimura said he changed majors twice before settling on Culinary Arts, completing an Associate in Applied Science in what was then referred to as Commercial Foods. That degree launched a successful career and a new business. 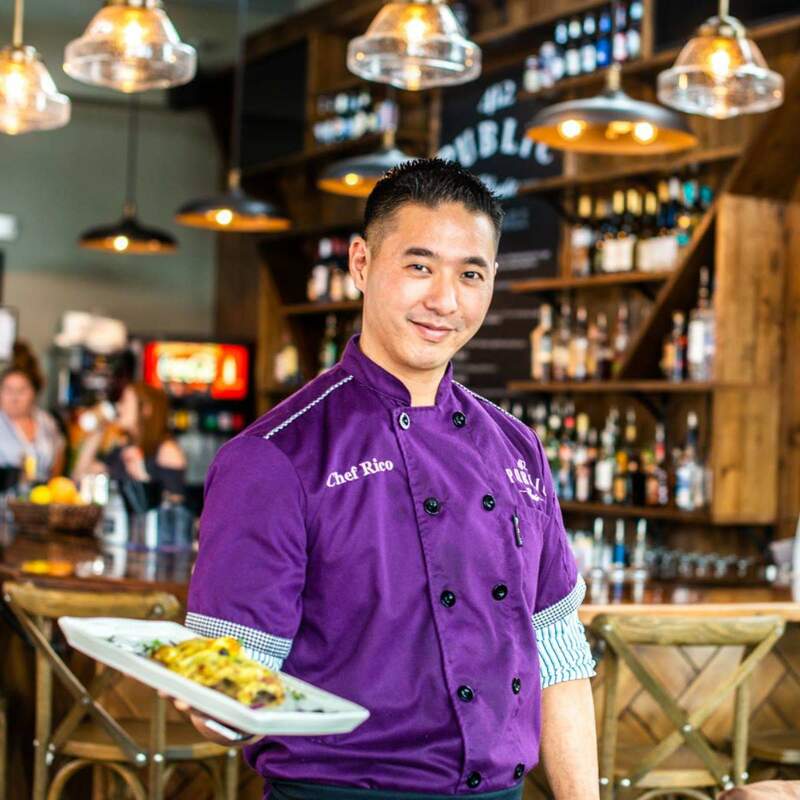 He is now head chef and co-owner of 412 Public House in Cullman with partners Stephen Gannon, Trey Jordan and Christine Nishimura, and he has made a name for himself as one of the area’s best and most innovative cuisiniers. International students add an element of culture and diversity to any college or university and contribute to an environment that promotes cross-cultural understanding and the development of global competencies that are increasingly important in the workforce. His inspirations come not only from his international background but also from his constant study of trends in the field. He is Japanese Brazilian, so he is multi-lingual, speaking English and Portuguese with a touch of Japanese. And he also picked up Spanish while at Wallace State, which he has continued to hone. Needless to say, he makes friends easily and he has contacts around the world. His Wonton Nachos are indicative of this international fusion style. He enjoyed trying his hand at an Irish brunch this year, which was a big hit for St. Patrick’s Day. Seafood, though, is where he first made his mark and that remains a feature on any menu. As chef and entrepreneur, he enjoys having the latitude to create and experiment. At Wallace State, his teammates would joke that Rico was so good that even if he took a year off he could still beat them. But he was also known for his humility and to be a great mentor, coach and encourager, who made everyone around him a better player. Now he has taken his talent and drive to succeed, first evident on the tennis court and now in the culinary arts, to inspire a new team. “I really enjoy what I do and I get to do any dishes that come to mind, and I try to get my staff involved as much as they want,” he said. For information about Wallace State’s Culinary Arts program, visit www.wallacestate.edu.